Take ordinary pecans to extraordinary. 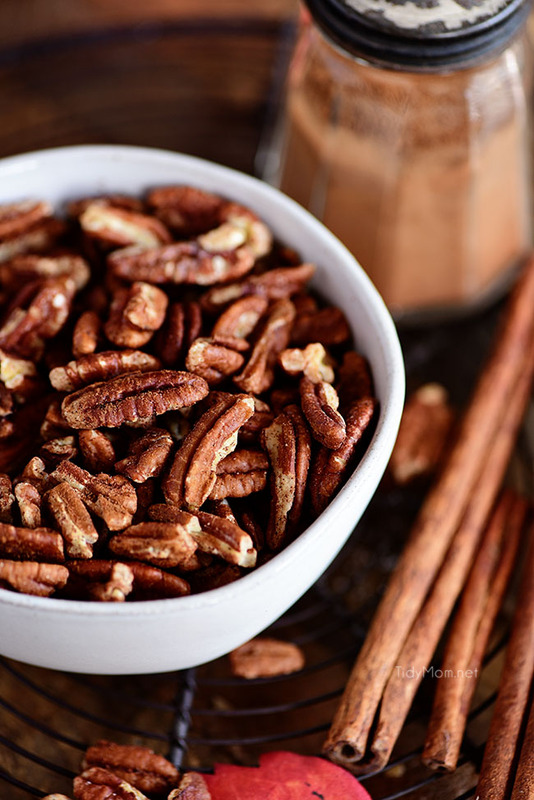 Toasted pecans are the best way to add extra flavor for healthy snacking or holiday baking. Learn how to toast pecans to add to all your favorite recipes. Whether we are eating Pecan Grilled Chicken Salad, Sweet Potato Bread Pudding, Spicy Ranch Goldfish Mix or Chocolate Pecan Pie Bars……we like our pecans toasted! 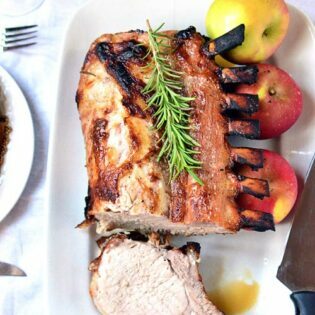 I have something really easy yet delicious for you today! Holiday baking is just around the corner and you may find recipes that require toasted pecans. Take ordinary pecans to extraordinary and learn how to toast pecans. Enhance the flavor of pecans by toasting them in the oven. 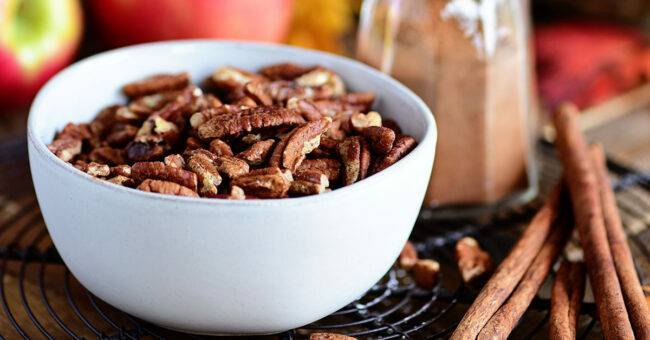 Toasted pecans are a wonderful addition to salads, desserts, oatmeal, snack mixes and more! I even like to add a sprinkle of cinnamon for Cinnamon Toasted Pecans. If you’ve never toasted your pecans, you’re in for a treat! 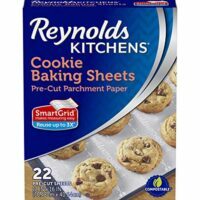 They fill your home with the most delicious aroma and baking them, adds a delightful bit of crunchiness to them. Toasting pecans (or any nuts) intensifies the flavor so much that you can often cut down on the amount of pecans you use in a recipe. The oils are activated and the nut becomes crisp. By toasting nuts, they stay crisp whether buried in baked goods or on top of a salad. Toasting will bring out more caramel and earthiness, while bitter and sour flavors are toned down. Toasting nuts also gives them a prettier appearance, which is nice when you are using them for a topping or in a bowl for snacking. Toasted pecans are really super easy to make. Technically, you can just pop them in the oven to toast them……..but you know the saying “everything’s better with a little butter“? Well, that certainly applies here! You can melt a little butter and pour over pecans, or sometimes I use spray butter. Either way, coat them in butter and give them a good stir to coat. If you want, they are also delicious with a little sprinkle of cinnamon. Just add the cinnamon after the butter and give them another stir. 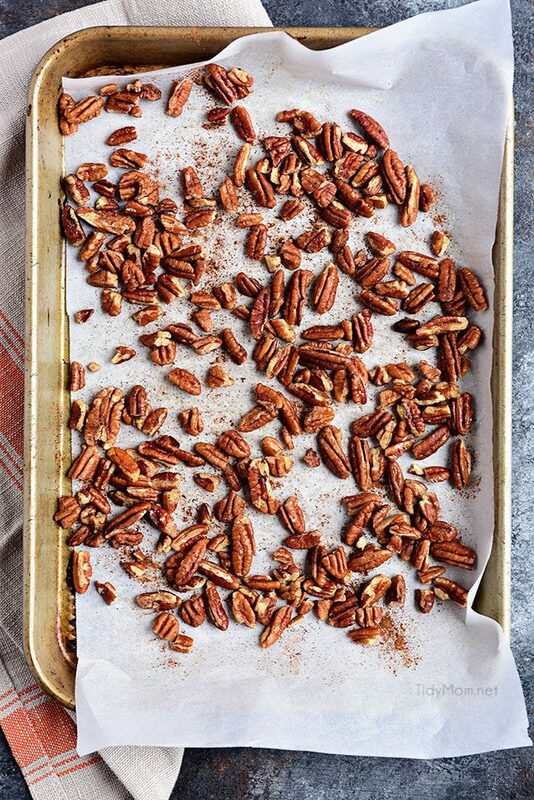 Place the buttered pecans on a parchment lined baking pan and pop them in the oven. The nuts are toasted when they’re evenly brown and have an aroma. Then, my friends, you have turned ordinary pecans into extraordinary pecans!! Delicious right out of the bowl or in your favorite recipes! How long do toasted pecans keep? The toasted pecans are going to be at their best if used immediately. The intense toasted flavor diminishes with time. But, you can store toasted pecans in a zip-top bag in the refrigerator for up to 1 month or in the freezer for up to 3 months. Can I freeze toasted pecans? Yes, you can freeze them! You can toast a large batch at a time (great idea if you find them on sale), let the nuts cool completely, then bag them in small portions and store in the freezer. FIY: nuts thaw out pretty quickly, so they’re pretty much ready to use right out of the freezer. Do toasted pecans go bad? Yes! They can/will go rancid. Extend their life bystoring them in an air-tight container or zip-top bags, in a cool dark spot, preferably in the refrigerator or freezer. Can you toast pecans on the stovetop? Yes, you can. Simply heat a dry skillet until hot (cast iron skillet works great for this), add the nuts and spread out in a single layer. Stir frequently to keep the nuts from turning too brown. Cook for 3 to 5 minutes. The nuts are done when their color has deepened and you can smell their aroma. Can you toast pecans in the microwave? Yes, you can use the microwave for smaller batches. Place nuts on a microwave-safe dish in a single layer. Microwave, uncovered, on high for 2-3 minutes or until lightly toasted, stopping to stir twice. Watch carefully to avoid burning the nuts. Adjust the time, depending on your microwave’s wattage and the amount of nuts you are toasting. Go toast your pecans!! Now that you’ve learned how to toast pecans, you can liven up baked goods, add crunch to your meat and cheese board, and salads, and add some healthy fats to your trail mix or snacks! 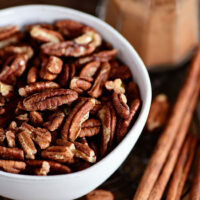 Like This Toasted Pecans Recipe? Pin It! Bake in center of oven for 8-10 minutes. Shake the pan occasionally or stir, to ensure the nuts toast evenly. The nuts are done when their color has deepened and you can smell their aroma. Cool before using or storing. So let’s hear it…..do you say PEE-can or Pa-con? Perfect tip for the holidays…we go through bushels around here during the holidays. Great tip Cheryl! Thanks. 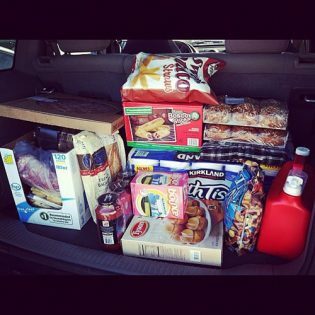 I’m committed to making this a great holiday season…. and bookmarking tips like this to make things go smoothly. Have a super start to your week! I love toasting nuts for recipes. It gives it that little something. I can’t wait to see what you’ve got up your sleeve! Toasted nuts are the best! Great post! When you say “enjoy alone”, you mean that I should hide out in a closet and eat these all by myself, right? Great tip, thanks for sharing! 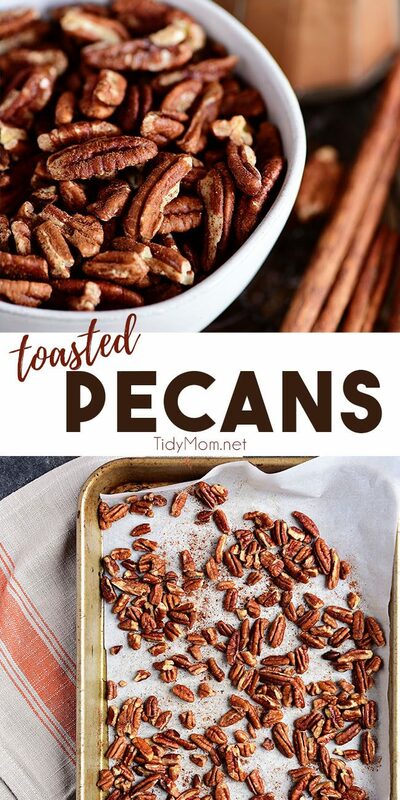 There is nothing better than toasted pecans in recipes! I say Pa-can because I was corrected by my father-in-law once. Great tips, Cheryl! great tip!! Hope you had a nice weekend! GREAT tips! It’s so easy to mess this up. I say pa-con, I wonder how many people say it each way. I love Dara’s comment by the way – too funny! Such a useful post, especially for this time of year when pecans are in recipes all over the place. Thanks for the tips! Thanks for the tutorial on this. I am bookmarking it for my upcoming holiday baking! I’m a northern girl that says pa-con living in a southern world where it’s definitely PEE CAN! 🙂 Toasting nuts is a definite must! Thanks for the tips! Very cool trick!! I never thought about spraying my pecans with butter before toasting, but it makes total sense and sounds WAY yummier!! This looks so easy! We do something like this every year at the holidays. I can’t wait to give this recipe a try. mmmmmmmmm. and i can smell em! I am trying this with the butter today. Thanks for sharing! Not sure to put butter or no butter on pecans for toasting for using in a pecan pie. What would you do. Need advise!!! Need advise on weather to toast or not toast pecans for a pecan pie. I have been reading both ways but which is beast? Great tip, but please advise on whether or not to roast pecans with butter when using in a pa-con pie please. Thanks so much! you would need to follow directions for the pecan pie recipe. How long do they keep if you toast with butter? I’m from New England USA and we say Pēcan. Love how such a simple tip can make them so good! So smart to spray the “pa-cans” with butter! 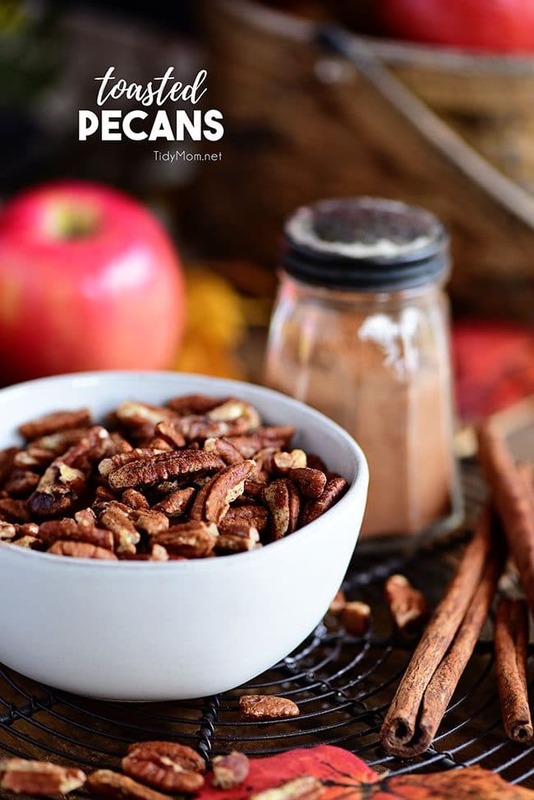 We have pecan trees here on the ranch and toasted pecans make everything from salads to desserts better! So sweet and crunchy. The perfect holiday snack! We’ve always said “pa-kahn”! And always followed by delicious! Love them toasted. Well, this recipe is just about as easy as it gets – and toasted pecans are so versatile! I make up a batch following these instructions to put on salads and they are perfect every time! Super yummy! I loved them! Thanks for sharing this easy recipe.. I can’t wait to smell them toasting, I know it will be divine! So easy! I love adding toasted pecans to my salads! 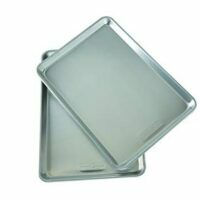 We say pa-can in Mississippi and they are great to serve at showers or parties. I love them in a salad with fruit!